What makes Byte Federal unique is that it develops its own ATM hardware and software systems in-house. This allows Byte Federal to customize cryptocurrency services for its users and keep the costs low. As a fully registered FinCen money services business, Byte Federal works closely and proactively with state and federal regulators to ensure growth and adoption. At present, Byte Federal owns and operates 64 crypto ATM’s with 20 more locations scheduled for deployment. This makes Byte Federal one of the top 10 US Bitcoin ATM networks*. Fast – Their Bitcoin self service kiosks allow cryptocurrency users to buy and sell Bitcoin within minutes in a secure manner locally. Innovative – Being in control of their hardware and software system allows them to optimize and continue adding services on the fly, while making our user interface easy to navigate. Compliant – a FinCen registered Money Service Business (MSB), proactively engages state and federal to make buying Bitcoin not just easy but also safe and secure as possible. Experienced – Their team has decades of combined experience in software engineering, finance, accounting, compliance, online security and hardware fabrication. Slow and complicated – online exchanges use overwhelming and complicated procedures. Connecting a bank account can take weeks, with banks sometimes flagging or cancelling the transactions. Untrustworthy sites – Some exchanges steal user funds or get robbed. Insecure websites pose as being safe and sell private information, credit card or bank information. Legacy banking hurdles – banks block Bitcoin transactions, or charge heavy foreign currency exchange fees. Credit cards are blocked for crypto purchases. Wire transfers are expensive and slow. Not intuitive – for the newbies to Bitcoin, navigating a crypto website can be a huge challenge, making it hard to adopt and enter the world of Bitcoin. Fast and secure – user registration takes only a few minutes. Provides a free client portal, with rich and ever-evolving interface to an increase array of crypto services. Safe and local – their local kiosk makes it ideal to adopt and jump into the crypto world swiftly. Users quickly become loyal fans with their better-than-banking services. Easy to find – Byte Federal’s fast growing network of proprietary Bitcoin ATMs strive to make easy access to Bitcoin ubiquitous. Private – helping to tackle and avoid online identity theft, their private and secure ATMs offer beginners and experts friendly method of embracing new financial world of crypto. Better than banking – adding more crypto and fintech services as well as controlling hardware and software systems allows them to continue to build a futuristic AMT terminal exploring the financial future that Bitcoin started. Lee Hansen (CEO) – Lee Hansen is fascinated by mechanical systems! Dating back to his earliest years he was constantly taking things apart and reassembling them as good or better than they were originally. In 1996 after working as a Financial Advisor with Hansen & Hansen for several years he repurposed himself as a Linux Systems Administrator and CCNA. Lee is an expert problem solver with extensive business & technical experience. He has personally designed & implemented hundreds of servers & networks across the US, created web applications with hundreds of thousands of users and has worked with clients ranging from consumers to fortune 500 companies to higher education & research organizations like Lincoln Labs. As an entrepreneur he has launched companies, acquired millions in funding, developed software, authored patents & innovated several robust business solutions. Lennart Lopin, MA (CTO) – was born in North-Eastern Germany (close to the original V1 rocket test site in Peenemuende), grew up in Vienna, Austria and lives currently in Sarasota, Florida. Coming from an engineering family (his dad is an electrical engineering and machine wizard) his first love was science, in particular Astrophysics – when he ran out of books he attended university lectures at the age of ten studying orbital mechanics. He graduated from university in Germany in 2003 with a master’s degree in Computer Science and a specialization in Computational Linguistics and Artificial Intelligence. His thesis focused on automated text-analysis and summarization. In 2005 his creative chatbot “Prelude” won an international championship in the category of best self-learning system. Mr. Lopin has spent vast amounts of time on various private and public software projects. He discovered Bitcoin in 2011 and has been involved in the Bitcoin ecosystem ever since, including the launch of his own cryptocurrency project “Marscoin”. Mark W. Paolillo, CPA, CGMA (CFO) – a member of the Venice community since 1972, joined the firm of Hough & Company, P.A., C.P.A.s in 1996. Mr. Paolillo graduated from South Carolina’s Clemson University in 1990, with a Bachelor of Science in Accounting. He is a Certified Public Accountant (Florida) and a Certified Global Management Accountant. He holds professional memberships in the American Institute of Certified Public Accountants (AICPA), Florida Institute of Certified Public Accountants (FICPA), and the Consulting Services Section of the AICPA. He brings a well-rounded skill set to Byte Federal in organizational structure, strategy, negotiations, finance, and compliance. This deal is on a first come, first serve basis. For full details and to make a purchase click here. On the day of the Bitcoin Cash Hard Fork, whilst taking your questions on our fourth Ask Me Anything (AMA) session, we put aside the drama and performed the first demo of our long awaited secondary market, for the most valuable Bitcoin and Blockchain companies who are due to launch shortly. B52 sees an opportunity to create an “any asset” digital bank in the traditional fiat currency banking world, allowing customers to buy stocks, provide peer to peer (P2P) loans and lending, purchase real estate, buy insurance or initiate payments instantly with cryptocurrencies at the same time. Qualifying investors can view their pitch here. Qualifying investors can view the pitch and invest here. In parallel to numerous other product launches and upgrades, we believe it is really important to modernise the core platform experience. The dashboard, which is the hub and heart of your investment portfolio, seemed to be a great place to start. After numerous iterations and analysing existing feedback and combining this with real user behaviour data, we have come up with a solution that emphasizes the most important features of our ecosystem, while making those less used less prominent. 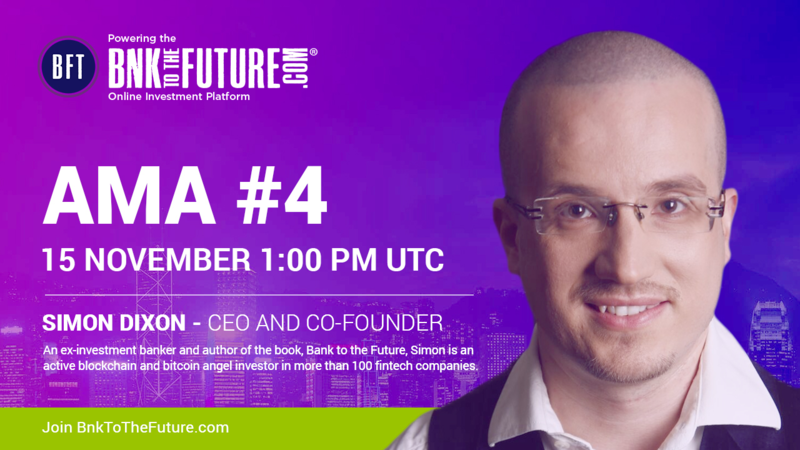 Our CEO and Co-founder Simon Dixon was recently interviewed at Financial Underground Kingdom (FUK) Part 2. You can read the full post here. Simon Dixon and Adam Meister once again meet on Bitcoin Meister channel to discuss the new trends in the Bitcoin Cash, as there are a lot of people excited about it’s movement on exchanges. You can read the full post here. Simon also gave live commentary before and after the Bitcoin Cash Hard Fork that can be viewed here. We have now passed $640,500,000 invested in funding rounds listed on our Online Investment Platform. We thank every investor who have contributed to an investment in the Future of Finance and Technology. We are delighted to have over 66,000 (and counting) real active registered BF Professional Investor Members on our Online Investment Platform who are waiting for more Financial Innovation & Technology Investment opportunities to invest in. Click here to find an opportunity you like.